Difference between revisions of "Ford C-Max Mk I"
'''Ford C-Max (C214). 2007–10 (prod. n/a). 5-door MPV. F/F, 1596, 1798, 1999 cm³ petrol, 1560, 1997 cm³ diesel (4 cyl. DOHC), 1753 cm³ diesel (I4 OHC).''' Facelifted Focus C-Max, with the Focus tag now dropped. Competent as with Focus on which it was based, appealing to buyers who wanted a compact MPV. Better quality than with Focus C-Max, otherwise much of the same. '''Ford C-Max (C214). 2007–10 (prod. n/a). 5-door MPV. F/F, 1596, 1798, 1999 cm³ petrol, 1560, 1997 cm³ diesel (I4 DOHC), 1753 cm³ diesel (I4 OHC).''' Facelifted Focus C-Max, with the Focus tag now dropped. 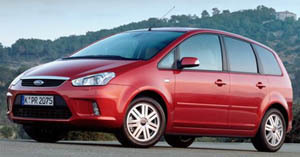 Competent as with Focus on which it was based, appealing to buyers who wanted a compact MPV. Better quality than with Focus C-Max, otherwise much of the same.